Certainly religion, and specifically Christianity, informed the attitudes of the Founders. Equally as certain, European political ideas shaped their thinking as well. American political philosophers, such as Franklin, Adams, Jefferson, and Madison, had, of course, read Hobbes, Locke, Montesquieu, and others. Yet is it far-fetched to think that semi-literate American farmers and tradesmen could read and articulate the ideas of such great and learned political theorists? The answer lies in the American love of newspapers, pamphlets, oral debate, and informal, down-to-earth political discussion. 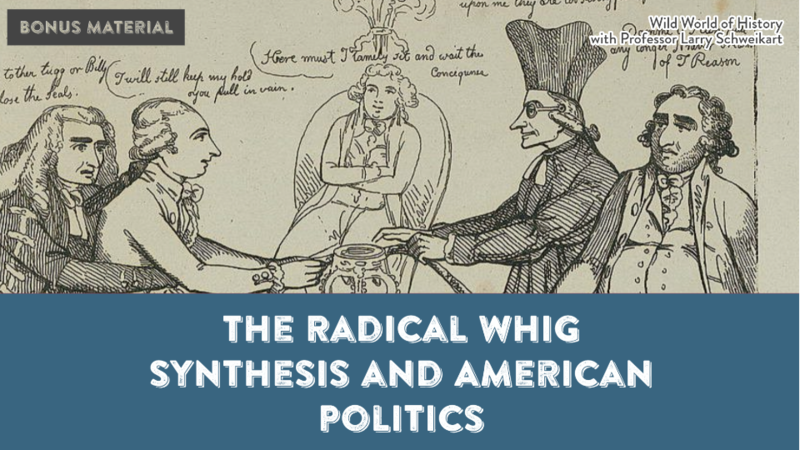 Over previous decades, all of the ideas of Locke, Hobbes, other European thinkers had been distilled and served up in plain English by a group of writers that historian Bernard Bailyn describes as the English “radical Whig” theorists. The Whigs, who had overthrown James II in the Glorious Revolution of 1688-1689 spawned a second generation of propagandists in 1707. Considered extremists and coffee house radicals” in post-Glorious Revolution England, the Whig propagandists nevertheless continued to question and assault royal authority. Writers like John Trenchard, Lord Bolingbroke, Thomas Gordon, and Algernon Sidney, did not accept the conventional wisdom that the toppling of the Stuarts had forever removed all threats to English liberty. In the first third of the 18th century, radical Whigs relentlessly warned of the tyrannical potential of the Hanoverian Kings—George I and George II. Bailyn and others have shown that influential Americans read and circulated the writings of Trenchard, Gordon, Sidney, Lord Bolingbroke, and their fellow Whigs. A quantified study of colonial libraries, for example, shows that a high number of Whig pamphlets and newspaper essays had made their way onto American bookshelves. Moreover, the Whig ideas proliferated beyond their original form, in hundreds of colonial pamphlets, editorials, essays, letters, and oral traditions and informal political discussions. What made the Whig ideas so popular? Part of the answer lies in the provincial nature of American society. Americans were an isolated, agricultural people, living hundreds of miles from those more urbane leaders who ostensibly governed them. This rural, provincial status led quite naturally to a state of mind suspicious of outside controls and centralized authority exercised by “strangers.” That physical isolation, despite the demands of farming or trade, also meant that whatever free time a man had usually went to reading the Bible (which was by far the most common book in American society), as opposed to printed matter involving politics and Whig views. Yet the success, and further radicalization, of Whiggery in America was also tied to the simplicity and compelling nature of the Whig ideas themselves. Whiggery was, in a very important way, a philosophy for non-philosophers. It was a philosophy that semi-literate and anti-intellectual Americans easily understood and enthusiastically embraced. It was simple because it was consistently libertarian—more so than any set of ideas before or since. To be an American Whig, one needed only to distrust and fear the authority and taxes of outsiders and be willing to use violence to resist that authority. Whig anti-authoritarianism spared no form of power. Whigs were suspicious of all power: religious, economic, military, and governmental. They feared a state church, a standing army, a mercantile economy, and a centralized government. What did they favor? They favored freedom of religion, a militia of citizen soldiers, a free market, and as little government as possible. If there must be government (and most Whigs considered it a “necessary evil”), then it should be small, close to home, and (most Whigs thought) democratically elected. This was the American Whig creed, and those who advocated Whiggery did so everywhere, not just in books and published essays. Whig ideas circulated by word of mouth among rustic American farmers, tradesmen, professionals and governmental leaders; they percolated through common discussion in taverns and at militia musters; they were preached from the pulpit and discussed around the dinner table each evening. In short, Whig ideas were everywhere. It is significant that Americans as different as Benjamin Franklin and Thomas Jefferson shared essential Whig ideas. Franklin, 39 when Jefferson was born, nevertheless had much in common with the Virginian. Both proposed or sponsored the main university in their colony; both traveled in Europe, where they received welcome receptions in France; both were scientists—Renaissance men who enjoyed music, literature, architecture, and invention. Although Franklin eventually honed an image in France as the “frontier” American, even to the point of wearing a coonskin cap, the two men in different ways chiseled the marble of what Europeans saw as representative (if not “typical”) Americans. Franklin and Jefferson, like other rebellious colonial leaders, had a well-considered and thoroughly developed political philosophy for supporting their rights as Englishmen, or, if necessary, their break with the mother country. Franklin, who served as an intermediary and correspondent between the colonies and Parliament, lost influence in England in 1774 after publication of the “Hutchinson letters,” in which Franklin shared with Boston leaders letters he intercepted from Governor Thomas Hutchinson requesting more troops to crush opposition. By then, the public at large, even if not fully in tune with revolutionary Whig ideologies, chafed under the heavy-handed application of the Navigation Acts, while concern deepened over the willingness of the British government to alter policies or inflict new burdens at will. Sometimes one policy acted in diametric opposition to another. For example, the British anti-slavery movement started to receive official support at the time as a means for the Empire to increase its control over the colonies as a means to “civilize” and “Christianize” natives in Africa. Yet at the same time, subsidies protected certain plantation products in the American South, thus increasing the demand for slaves, intensifying the pro-slave forces in the southern colonies, and making abolition less likely. But whether slavery, taxes, or stamps on paper, the economic impact of the Navigation Acts was not nearly as important as the political threat they presented. England had given the colonies a reason to organize and unify through the Intolerable Acts, bringing war one step closer. Another incident with bloodshed, such as the Boston Massacre, might rend the final, fragile bond that still joined the colonists to England. 1. Joyce Appleby, “Republicanism in the History and Historiography of the United States,” American Quarterly, 37 (1985), and the entire issue, 461-598; Jack P. Greene, Peripheries and Center: Constitutional Development in the Extended Policies of the British Empire and the United States, 1607-1788 (New York: Norton, 1990 [ 1986]); Gordon S. Wood, The Radicalism of the American Revolution (New York: Knopf, 1992). 2. Christopher L. Brown, “Empire without Slaves: British Concepts of Emancipation in the Age of the American Revolution,” William and Mary Quarterly, 56, April 1999, 273-306. 3. The question of whether or not the Navigation Acts even could have imposed enough of a burden on the colonists to provoke a rebellion has been substantially answered. Several economic historians, as detailed in Jeremy Atack and Peter Passell, (A New Economic View of American History, 2d ed., [Boston: W.W. Norton, 1994), conclude that the heaviest burden the Acts could have place on Americans was about 1% of GNP. In other words, the Navigation Acts, as an economic issue, were not significant enough to have caused one-third of all Americans to take up arms against the British.